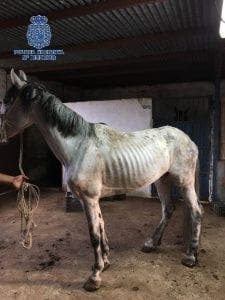 POLICIA Nacional have arrested two people for animal abuse after rescuing four malnourished and dehydrated horses in Velez-Malaga. 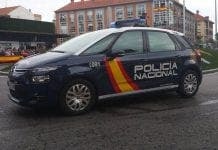 A 40-year-old man and neighbour of the Axarquia locality were cuffed on suspicion of continued animal abuse. 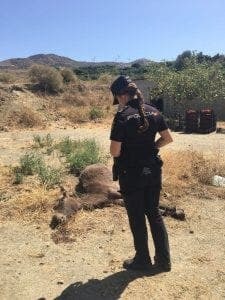 Following a tip-off from a local resident, an inspection carried out at the finca also revealed a corpse of a young mule, about one year old, with signs of having suffered prolonged abuse and neglect. Veterinary reports verified the unhealthy conditions in which all five horses lived on the land, located in the Zamorana estate. One of the horses was found outside its stable and tied by the neck with a rope to a thick chain without water or food, other than some tomatoes scattered on the ground. 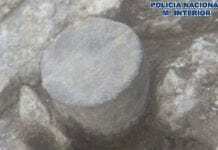 Another was found in a stable without water or food and with symptoms of being left alone for months. The owner was arrested for animal abuse, lack of nutrition and veterinary care of animals, as well as the omission of legal duties. The horses are being brought back to health by specialist vets in Fuente de Piedra. Evil inbred retard bastards. Chain them up and leave them to die. I sincerely hope they dont get off with a pathetic slap on tbe wrist because the judge happens to be related or a friend!